Darrell Scott, the father of the Columbine shooting victim Rachel Scott, wrote a book called Chain Reaction: A Call to Compassionate Revolution. Notice the words “A Call” and “Revolution”. Rick Joyner and Cindy Jacobs, two Zionist Dominionsts, promote a revolution in the church in The Elijah Revolution. It is no coincidence that Rick Joyner also wrote a book titled The Call. Jim Goll, another Zionist Dominionist, also wrote a book called The Coming Prophetic Revolution: A Call for Passionate, Consecrated Warriors. With this in mind, since Darrell Scott uses the same terminology as Jim Goll and Rick Joyner and Cindy Jacobs, when she talks about young people (Rachel Scott was a good example) being part of a “revolution” or Joel’s Army, Darrell Scott may be a part of the Joel’s Army revolution as well. Darrell Scott was involved in the Call DC; he even addressed the assembly, as is shown at the conclusion of Joel's Army: The Revolution Generation at Cephas Ministry amongst many other websites. Rachel Scott had premonitions about her death, suggesting some sort of spiritual involvement. Not all premonitions come from evil and powerful spirits, but in light of everything surrounding Columbine they become suspicious, especially when the Scott family has associated themselves with the Charismatic Revival movement. CRAIG SCOTT: I believe that God spared my life for a reason. I believe that even on that day He was in control. GORDON ROBERTSON: Did He speak to you during this time? I hear that you actually heard His voice. What did He tell you? CRAIG SCOTT: I was underneath the library [desk], and I heard Him speak to me and say simply to get out of there. Usually, God speaks to me as a small voice or by leading me with the Holy Spirit. But this was more of a voice. It was the most peaceful, understanding voice I have ever heard. I got up and helped rally some of the other students that were still in the library, saying, 'Come on, I think they are gone. Let's get out of here.' We ran out through an emergency exit to safety behind some cop cars out in a field. Soon after we had all gotten out, the two shooters returned to the library. I think that if we had been in there, more of us probably would have been killed. When Rachel Scott’s funeral was shown on CNN on 4/24/1999, it was the most watched televised event in CNN's history (it may have been surpassed since then but most likely not, probably only Maitreya’s Day of Declaration can beat that!). Millions or billions may have seen Rachel's funeral on TV. Some believe that Rachel's funeral even ranks with the funeral of Princess Diana in terms of the viewing audience. This could relate to a statement made about Diana's funeral by Share International, the web site of Lord Maitreya, who is a false Christ. Q. Did Maitreya stimulate the worldwide peace marches — that is to say, were people responding to His energies when they decided to demonstrate? This was originally posted on Share International but was removed. Eastwood’s website has more detail about Diana's involvement with Maitreya, which could mean that Diana’s death was indirectly connected with Rachel’s. Q. On the day of Princess Diana's funeral there was an extraordinary, heartfelt response by millions of people in the UK - the like of which has never been seen before. Is it possible that Maitreya gave a blessing to the nation? What this is trying to say was that at Princess Diana’s funeral, Maitreya used his demonic energy or possibly scalar technology or both to “potentize” or intensify the emotions of the masses as a rehearsal for the Day of Declaration, when Maitreya shows himself to the world. But how is Rachel Joy Scott of Columbine involved? This gets VERY intricate. If Diana’s funeral was very popular and was used by Maitreya as a rehearsal for the Day of Declaration by his outpouring of emotional/mind control during Diana’s funeral, and Rachel's funeral had as many viewers as Princess Diana’s, then it might be true that Maitreya used Rachel’s funeral as a rehearsal as well. Another instance where Diana and Rachel correlate, and also connect with the “Illuminati” conspiracy and the 9/11 WTC attacks, is the symbolism of the TORCH. 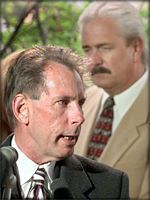 Pastor Bruce Porter from the Littleton area was very active in both the Columbine and 9/11 tragedies. In Memory of Rachel Scott and a Wake-Up Call to America's Youth details what Pastor Bruce said at Rachel’s funeral on 4/24/99. Pastor Bruce openly called for youth to pick up Rachel’s bloodstained TORCH and to become Joel’s Army! “She was a warrior, but she didn't fight her war with guns, and with instruments of destruction. Rachel fought with the implements of love and compassion and caring mercy. She loved everyone she met. But as a warrior, Rachel carried a torch that was stained by the blood of the martyrs from the very first day of the church's existence…nearly 2,000 years ago. This warrior has now dropped that torch and gone on to her eternal reward. “Young people here today, hear me. I want to issue a challenge to each and every one of you. Don't despair of life. Don't despair of what's happened to you. Rachel carried a torch—a torch of truth, a torch of compassion, a torch of love, a torch of the good news of Jesus Christ her Lord, of whom she was not ashamed—even in her hour of death. I want to lay a challenge before each and every one of you young people here today: The torch has fallen from Rachel's hand. Who will pick it up again? Who will pick up the torch again? “Students, as well–meaning as our politicians have been, they couldn't protect you. As well meaning as our police—and I'm a volunteer fireman—we couldn't help you. The police did all they possibly could. The legislators had laws in place that should have protected you already, and the laws didn't protect you. And I want to ask your forgiveness on behalf of many of us who are parents. Forgive us because we failed you. We failed Rachel. “It's up to you. If you're going to take your schools back, you have to do it. If there's a stand to be taken, it can't be taken by politicians, as well–meaning as they may be, or by legislators or by the police or by even your parents. Students, you have to take the stand. It's your school. “I am hereby issuing a challenge to every student in every school across this nation. Pick up the torch that Rachel carried. Pick it up and hold it high and stop being a victim. Be proactive, speak to the culture you live in, declare a cultural revolution of compassion and mercy and love and foresake violence. You have the power within your hands, young people. We can't do it. We have failed. The symbol of the torch has Satanic meaning and represents Lucifer's Light. So when someone picks up Rachel's Torch, he/she is carrying the Torch of Lucifer. When the “Illuminati” had their hand in the 9/11 event, they memorialized it by using a torch to symbolize their involvement. Other events having the Illuminist signature of Lucifer's torch are the assassination of John F. Kennedy (represented by his “Eternal Flame” at his gravesite) and the death of Princess Diana. A picture of Diana's Torch memorial in Paris is shown as Diana's Flame of Liberty. Bruce Porter’s website also shows Rachel's Torch. Note the name of Bruce Porter’s ministries is “Torchgrab”? What is worse is that Darrell Scott and his family including Craig Scott and Dana Scott (Rachel’s sister) and many others, are all sounding off in unison that young people must be picking up Rachel's Torch. Darrell also talks about picking up her torch in Rachel’s Revival. “Afterward, Scott said reliving the memory of Rachel's death takes its toll, but it is all worth it. The mother and father of John Tomlin, whom Darrell Scott praises in his books have also decided to take up the Satanic torch of Rachel Scott, but instead for their son John. “John and Doreen Tomlin, parents of slain student John Tomlin, carried a torch and led a procession in their son's pickup truck. The torch, inscribed with the 13 victims' names, was lighted in an earlier memorial service to symbolize the effort to carry on for those who died. Bruce Porter also talks a lot about the 9/11 World Trade Center attacks. In this way, he can be related to Maitreya the false Christ. Referring to a dream Porter had about Columbine, you'll notice a strange thing connecting the Columbine event to the World Trade Center and Maitreya. “LOS OSOS - Bruce Porter remembers the dream vividly: There are young people sitting at tables around a large room, a library, perhaps. Then, odd popping sounds, like gunshots or firecrackers, break out. Red spots here and there appear. Then the air itself turns red. People flee from the room, with looks of wild terror on their faces. “Porter, a pastor close to the Columbine High School tragedy, spoke at Los Osos Christian Life Center last month, and talked about how the focus of his dream changed. The faces of the young people turned from fear to boldness, from terror to steely-eyed determination. They re-entered the fearful room determined to help those still inside. “He woke up screaming about kids being killed, or killing each other. At first, his wife Claudia thought he was having a heart attack. The experience was so vivid, so unnerving, so real, that she recorded details of his nightmare in her journal. Later, Porter is unable to shake the vivid images. “Then on April 20, 1999, three months to the day after the dream, the phone rang at Porter’s Littleton, Colorado church. Getting his morning coffee, he picked up the phone to hear a woman from his congregation on the other end of the line. Q. Was there no way the Masters could have prevented the terrorist attack on the World Trade Center and the Pentagon? A. No, not directly. That would have necessitated an infringement of our free will. Nevertheless, the Masters did warn the American authorities three months ago that some such attack was planned. Q. Did the Masters have a part in mitigating the effects in any way? It seems like Maitreya did to those who died in the WTC attacks, those who witnessed Diana's funeral and possibly Rachel's funeral what he will do on the Day of Declaration -- he conducted emotional/mind control. Bruce Porter received dream that warns of Columbine shooting THREE months in advance. Maitreya warned the government THREE months in advance that airplanes would crash into the World Trade Center and Pentagon. This is a strange correlation indeed. Why are Christians and New Agers receiving similar premonitions of future tragedies? Could the warnings be from the same source? Or do these individuals have prior knowledge of impending disasters and is "three months" a signal that they were accomplices in planning these events? Those who are working to bring about the New Age are using a dialectical process in which seemingly opposed movements of “right” and “left” ideologies are actually working towards the same goal. In the end, the Joel’s Army Revolution (from Columbine/right-wing/Christian/Republican) will merge with Maitreya’s New Age Movement (from WTC/left-wing/Eastern Religion/Democrat) and both will be exploited to enforce the will of the Kabbalistic Jewish empire of the Antichrist. In this way, the Illuminati are able to deceive “Red” Christians/Conservatives and “Blue” New Agers/Liberals at the same time. While Maitreya may say right now that he is against the unjust treatment of Palestine by the Israelis, with the above dialectical process in mind Maitreya might very well be working for the Judeo-Freemasonic conspiracy that will destroy the Palestinians. Of this, more will be said later. Q. There was a story in the media about one of New York's firemen stuck underneath rubble after the World Trade Center attack. He couldn't move and thought he would die. Suddenly a torchlight flashed nearby and he heard a voice saying 'Grab hold.' He got hold of an arm and was pulled up. Someone behind him supported him and he realized he was in a human chain of people escaping. When he got out into safety he looked for the man with the torch, but he was nowhere to be seen. He has since called the man who saved him his 'light angel.' Was the man with a torch a Master or Maitreya? A. He was the Master Jesus. Q. In the days after the crash in New York there was a young man with dark curly hair, called 'the Angel of New York,' who taught the people how to comfort each other. Was he the Master who lives in New York? A. No, he was the Master Jesus, who lives in Rome. With this is mind, Maitreya and Pastor Bruce Porter now seem connected in two ways: the “three months” connection and the “torch“ connection! A firefighter who was in the World Trade Center on September 11 was saved by a false Master Jesus, the disciple of Master Maitreya. This Master Jesus held a torch, much like Pastor Bruce and Darrell Scott told of Rachel Joy Scott holding a torch. “Master Jesus” was also called the “Angel of New York.” And Rachel, along with the other Columbine victims, are now referred to by their fans as the “Angels of Columbine”! Also notice that the words the firefighter heard were “Grab Hold.” Does this sound a lot like when Pastor Bruce told the youth to grab hold of Rachel's Torch? On the cover of the book “The Martyr's Torch: The Message of the Columbine Massacre” by Bruce Porter, it depicts a lot of hands trying to grab onto Rachel's Torch, almost like the ”human chain” which the New York firefighter saw when he was saved by Master Jesus. Maitreya's stance against Israel in contrast to Bruce Porter's support of it is all part of the dialectic process, because Madame Blavatsky and Alice Ann Bailey both knew of and promoted Maitreya the Christ, and both were into Theosophy which is based primarily on the Jewish Kabbalah. If Maitreya is a Kabbalist, this does not mean he would not try to destroy the Jews, for there is much evidence that it was the Zionist Jews who launched the Holocaust in order to create demand for the State of Israel and drive the Jews out of Europe to Israel. “... Both sides are rooted in messianic dreams of One World Government/Order. The idea of a single perfect human government is the true essence of Judaism in all of its forms. Jews fail to realize that such is a recipe for tyranny and oppression in all of its worst forms. Boundaries, nations, races, etc. exist for a good reason as they provide a limit to evil. “Many now expect the return of their awaited Teacher, whether they call him the Christ, Messiah, the fifth Buddha, Krishna, or the Imam Mahdi. Millions now know that the Teacher who fulfills all these expectations is already living among us. “Share International is very multi-cultural and in that sense would fit in with the secular Jewish. I have a hunch the Maitreya person is possibly Sephardim and if so might make Share International more palatable to the religious Jews. I see Creme's leaving Marxism for what he does now as jumping out of the kettle and into the fire. Adolf Hitler, who was also part Jewish, was used by the Zionists to to kill his own people and thereby create sympathy for the Jews, demand for the State of Israel and to drive the Jews out of Europe to Israel. [See: New Israel: Zionism] It is interesting that the Columbine murders took place on the same calendar day as Hitler's birthday -- April 20. The analogy here may be that as Hitler was born on April 20, Joel's Army was birthed by Dylan Klebold and Eric Harris, both of whom were half Jewish like Adolf Hitler. So while Maitreya may seem to be against Zionist Israel and their oppression of the Palestinians, he is probably working to further the ends of the Zionists. Possibly he will be overthrown once his mission is accomplished. Will Maitreya be judged as FAKE Anti-Christ by the REAL Anti-Christ at Mid-Tribulation? Maitreya can also be associated with Rachel Joy Scott in another way. Rachel’s hands were shown on her website (RachelScott.com) but this webpage has been removed subsequent to this expose. However, the drawing of Rachel's hands is posted on the Prayer in School website. 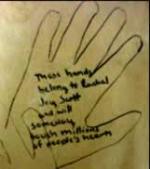 These are the exact words that Rachel Scott wrote on the sketch of her hands. Rachel is supposed to have been prophetic here and when the shootings happened, everyone who saw these hands were very moved (i.e. deceived). But there is another similarity to Maitreya here. Rachel Scott’s hands seems to have a strange likeness to Maitreya’s hands which are are supposed to cause Maitreya’s energies to affect you. This shows the hand of Maitreya that appears apparently out of nowhere, supposedly by supernatural power. The hand of Maitreya and the hands of Rachel are the same idea, and this idea could have been imprinted by Maitreya into Rachel’s mind, hence the symbolic resemblance. Or else the leaders of the Joel's Army youth revolution are using the same mind control technique on Christian young people that Maitreya and Benjamin Creme are using on non-Christians. Also concerning the symbolism of Columbine, the following comments about the Space Shuttle Columbia, which blew up over Texas, could apply to the Columbine school shooting as well. “In the wake of the recent Columbia tragedy, I was asked to repost some of the older musings on the symbolism of Columbus, Columba and the Columbine incident. A columba is a dove (the branch-bearer) symbol of Semiramis or Isis. Not coincidentally, the International Space Station is referred to as ‘Isis’. The ISiS will be affected by the loss of the Columbia. Columba = Dove. According to noted occultist Madame Blavatsky, the dove is one of several birds, including the phoenix, associated with scorpio, mystical counterpart of the winged serpent or phoenix. Bina = Twofold, that is, two of things that match, a pair. In the first statement, Darrell means the 13 tears Rachel drew in the picture is prophetic because 13 people were shot at Columbine. This statement is redolent of “Rachel weeping for her children” -- the Jews -- in the Bible (Matt. 2:18). 13 is a very important number to Kabbalist Jews because it refers to the 13 tribes of Israel blessed by Jacob (Israel) in Genesis 49. The 12 Tribes of Israel became 13 when Joseph's inheritance was divided between his two sons, Ephraim and Manasseh. This also explains the symbolism on the Great Seal of America, which features the Phoenix bird, and why the Phoenix bird (America) must be destroyed -- so the 13 tribes will return to Israel. The red rose symbolizes their imagined “divine” blood to the Merovingian bloodline which claims to be the bloodline of Jesus Christ but is really the demonic bloodline of fallen angels who mated with human women in Genesis 6. The Rose Croix (Rosy Cross) is the symbol of the Rosicrucians, the lost tribes of Israel who are conspiring to destroy the United States. If the third quotation states that the rose is America’s flower, and the Phoenix in the quote before that can symbolize America as explained in the Death of the Phoenix article, it could be symbolic that the Columbine plant coming out of the rose means that from the tragedy coming out of Columbine will “raise up a remnant of this generation”, which is symbolically speaking of Joel's Army, and out of Columbine would come Joel's Army! It could also mean that when America, symbolized by the Phoenix, is starting to be destroyed, then Joel’s Army will rise as well. The Azusa Street 100th year anniversary is 2006, which is the same year as the disasters foretold in the Death of the Phoenix article. The ROSE is also connected with Princess Diana. In “Candle in the Wind,” Elton John the musician calls Diana “England's Rose.” Diana was known as England's Rose. America's national flower is a Rose, and Diana was a rose, and America came from England. A long time ago there were some news sites that linked to “The Making of a Goddess” which claimed people saw Diana alive, as a nurse, for example, after she died; however, those “news” sites are now gone. There is also a statue of Diana portrayed as the Virgin Mary, to be venerated and worshiped. One article in the BBC that linked to the above web site depicts Diana as the Virgin Mary. “Heard beneath the sacred ground” can mean it has to do with a FUNERAL and the faint voice of a lady. In other words, Princess Diana’s funeral which millions watched and Rachel's funeral which ranked right up there with Diana's! “Human flame for the divine voice shines.” Human FLAME? The flame is represented Diana’s Torch memorial in Paris AND Rachel’s Torch that Bruce Porter and Darrell Scott told the youth to take up. The line about the blood probably has something to do with murder, like Columbine with blood and Diana when she died, and the “holy temples of the impure ones” refers to those Christians who don’t accept the New World Religion that will be promoted through the veneration of Princess Diana and Rachel Scott! Nostradamus' prophecy also has something quite peculiar. In Quatrain 4.24, consider the number 4.24 and how it is the same as 4/24/1999, the date Rachel Scott's funeral. The funeral that surpassed Diana's TV viewing audience on CNN and got the highest ratings ever in history, is the name of that prophecy that applies to both Diana and Rachel! Darrell Scott is also into Kabbalistic Bible codes. Darrell is cited as asking for a Bible Code search to be done and there is actually a picture of the codes about Rachel at Bible Codes.com. Tupac Shakur is allegorized as both Jesus Christ and Machiavelli. Diana is venerated as a Goddess image of the Virgin Mary. Both were thought to be alive by some. Is it possible Rachel Scott, when Joel’s Army comes, could be put on a pedestal like Diana and Tupac? It is very interesting that Tupac chose to nickname himself Makaveli, named after the real Machiavelli. If in fact Tupac staged his death or will come back to life by demonic supernatural means, he may be amongst those who joined the "Resurrected" company along with Princess Diana and possibly Rachel Scott and Lauren Townsend (more on Lauren later) to promote and usher in the New Age of Aquarius when the Antichrist, Thomas Plantard de Saint-Clair who is the Grand Master of the Learned Elders of Sion, takes his throne over the world as the King of the Jews (more on him later). Dealing with things which seem prophetic in nature, there have been many premonitions by the students and their families about Columbine High School which could have been the result of occult involvement. It is also of interest that many of the names of the Columbine victims came out of the Bible like Daniel, John, Matt (Matthew), Rachel, and Isaiah. There is a strange picture of Cassie Bernall at the website of her church, the West Bowles Community Church. Look in the section called “Watch” and you will be greeted with the “All-Seeing Eye” (of Lucifer). Then open up the video called “Cassie Bernall” which shows some pictures and a video clip of Cassie Bernall speaking. In one of those pictures, Cassie Bernall put a necklace with a cross on it on her head, so that the cross is in the center of her forehead. The cross is positioned between her eyebrows, exactly where the “third eye chakra” is supposed to be located on initiated person. In New Age spirituality, this symbol is a statement of occult enlightenment. Strangely, Cassie does appear to be in an altered state in these pictures. In another picture, the same cross is in the palm of Cassie's hand. Although it is her left hand, the forehead and hand represent the locations where the Mark of the Beast will be received. In the report, Designer Marks of the Beast, one of the logos on Uth Stuph T-Shirts for Christian Youth Groups shows this “third eye chakra” as a cross on the forehead of an alien! Another Columbine victim, John Tomlin, listed many experiences of premonition in the book Rachel Smiles: The Spiritual Legacy of Columbine Martyr Rachel Scott. ”The night before his death, John stayed up until after 2 A.M. talking on the phone with his girlfriend, Michelle Oetter. She was sharing with John about some problems she was having with one of her friends. As their conversation wound down and they were close to saying good-bye, Michelle recalls that John said the strangest thing. He said, ‘Michelle, I know you’re going through some tough times in your relationship with your friend, but even if I am not around to help, remember you can always turn to God”. So five victims from Columbine (Rachel, John, Kyle, Isaiah, and Cassie) or members of their families had premonitions. I remember from an article on the internet I read somewhere that Lauren Townsend, another Columbine victim, DID know or write down that she knew or had a feeling she was going to die like all these other victims knew they would. Unfortunately, I could not find that article in my searches. These premonitions could be signs of some sort of occult involvement. Remember how they are similar to the "three months" coincidence between Bruce Porter and Maitreya? So it is safe to conclude that the premonitions that were involved with the people at Columbine could have had connections to the same spiritual forces of darkness that influenced Maitreya to tell American authorities about 9/11 three months before it happened. The invisible spiritual forces who were working through Kabbalist Zionists that are mobilizing Joel's Army could have given Columbine victims like Lauren, Rachel, and Cassie premonitions of their deaths, which they planned beforehand. The following is a “channeled” message from demons concerning the school shootings. The message came from a psychic medium named Wendy Chapman, who runs a New Age site. The spirits who spoke through her suggests that the premonitions the students had were from demons who preplanned for them to die so that it would teach humanity about spirituality in the wake of their death (Joel’s Army/New Age Maitreya) and prepare us for the New World Religion. “Are you advocating more school shootings? “These will happen whether or not we advocate them, as you say. “Indigos are reacting violently to the educational system and must change it soon - very soon. These acts of the violence will change things sooner. But people must learn to respond in love, not in fear. It is not the guns, though those don't help. It is the whole system and the way people treat each other. “More shootings may not be necessary, but we see more happening. Know that those who pass on from these events are those who have agreed to leave at this time, those who have agreed to participate in this divine lesson that is so painful for those of you in duality. Again, like the death of Princess Diana, this message gives the impression that the spiritual world is involved in the Zionist conspiracy and that the human agents who run the whole show are not alone in this diabolical task. Maitreya the false Christ may be one spiritual entity who is helping, but there are many other evil spirits as well, usually working under the guise of 'Love and Light'. Some people who were involved in the World Trade Center attack, strangely like the Columbine people, said things like they knew and hinted at it when they told their loved one goodbye that they wouldn't come back. Websites also claimed that 4,000 Jews called in sick from the World Trade Center the day it would crash, Although the ADL has debunked these reports as being “absurd,” it is possible that they were warned of impending danger. According to CNN, Eric Harris, who was a shooter at Columbine, also planned to attack New York City by flying a plane into a building before 9/11 happened. And, it is interesting that Dylan Klebold was born on September 11, 1981. There is another suspicious date related to the Columbine event. Lauren Townsend's birthday is January 17, the very important day on which the Priory of Sion convenes to elect Grand Masters. Rachel Scott and her family are not the only Columbine family who may be affiliated with New Age occultists. Dawn Anna, the mother of the Columbine victim Lauren Townsend, stated in an interview on Oprah that she saw her deceased daughter Lauren take the form of a hawk that flew around to tell her messages. “My first reaction was that I needed to bow my head and look down. But as soon as I put my head down something told me to look up. And so I just leaned back in my chair and I did look up. “I saw this one little white cloud. And I started focusing on it, and imagining Lauren on it. And asking what she was doing, could she see us? Do you know how much we love you, do you know how much we miss you? “And as I'm looking up, a hawk came up from the foothills and started circling directly above us. It circled in this slow pattern, and my heart just leapt, it just jumped in my chest. Dawn Anna said “something” told her to look up. Again, “something” that told her to look up could very well be a demonic spirit posing as Lauren herself who may have returned to promote Lucifer’s New Age Zionist Kingdom on earth after death. In the Lifetime movie “Dawn Anna” which ironically starred the Jewish Debra Winger who played as Dawn Anna, it depicts the life of Dawn Anna and Lauren Townsend. (See also IMDb) Near the end of the movie, after the incident showing the shooting at Columbine, Dawn Anna is shown looking at a hawk flying overhead and she knows it’s her daughter Lauren. In the movie, like Rachel Scott, Lauren also drew pictures that were strange. While not necessarily prophetic like Rachel’s, the movie depicts the actress Quinn Singer, who plays the older Lauren Townsend, drawing pictures of herself and a hawk suggesting she really likes hawks and, ironically, would become a hawk in both the movie and real life. Becoming a hawk after death, as Lauren Townsend was perceived to have done, is not a biblical concept about the afterlife of Christian believers. Not only that, but if it happens that this 'hawk' of Lauren Townsend becomes involved with Joel's Army, it could give reason for Christian doctrine to be altered to allow the belief that people really do communicate from beyond the grave, which is highly New Age. It could also be possible that Rachel and Cassie are appearing as hawks flying alongside Lauren and giving messages to people around Columbine High School. In fact, Lauren Townsend returning as a hawk is an occult concept. According to one New Age website, the hawk represents Horus, the Egyptian sun god and savior, and the hawk also appears frequently to people following the death of an occult initiate. This is stated on the Super Torch Ritual site which is owned by Goro Adachi, an end-times occultist who is into deciphering patterns concerning the end times. Notice the name of the website? Torch ritual? “In an Egyptian Papyrus, as mentioned in one of David Hudson's 'white powder gold' lectures, an initiate partakes and likens himself to the golden hawk of Horus: "in the ancient Egyptian text it was always referred to as the 'What is it? ', and if you read in the papyrus of Ani that was found in the tomb of Pepe the 2nd in old kingdom Egypt, it says, 'I am purified of all imperfections, what is it, I ascend like the golden hawk of Horus, what is it, I come by the immortals without dying, what is it, I come before my father's throne, what is it, and she goes on and on, page after page, talking about all these attributes that you acquire as you ascend, but they always stop and ask the question, 'What is it'?" Lauren Townsend's alleged reappearance in the form of a hawk is a sign that Dawn Anna and her daughter are promoting the New Age belief in reincarnation. If Rachel Scott and Cassie Bernall also fly around with Lauren as a hawk giving messages to people, they could be a very dangerous trio as they spread New Age occultism. In fact, there have been reports of the Columbine victims appearing as hawks and owls to some people and visiting others as themselves in dreams and visions. The “Lauren,” “Rachel” and “Cassie” hawks only appear as real hawks and owls to people when they are outside and awake. In dreams, they don't appear as hawks and owls but as their own selves so they can be recognized. In the mystery religion of Egypt, the hawk represents Horus and the Owl represents Thoth/Hermes, the god of divination. When God's people inquire at the oracle of Thoth, they are practicing divination, which God has forbidden for their own protection. Of course, Lauren Townsend, Rachel Scott and Cassie Bernall are not making these appearances as owls and hawks, but rather demonic entities are impersonating them as reincarnated beings in order to deceive people. Also, these demons are giving specific directions to the spiritually naive friends and relatives of Columbine victims and others they deem to be good agents to promote the youth revolution. Of course, manifestations that are perceived to be Lauren Townsend, Rachel Scott, and Cassie Bernall would be a welcome sight to many grieving eyes and ears who are happy to see their favorite Columbine martyrs resurrected from the dead as hawks and owls, and this would identify them with Horus and Thoth/Hermes, the mythical Egyptian gods who were allegedly reincarnated as well. Lauren Townsend and possibly Rachel Scott, given their connections with the Dominionists, may even be regarded as "Gods" like the reportedly reincarnated Princess Diana and rapper Tupac Shakur. How do Rachel Scott, Princess Diana, and Tupac Shakur fit into the agenda of the Antichrist? When Thomas Plantard de Saint Clair comes on the scene, it is possible that Diana, Tupac, some of the Columbine victims and other prominent people who are dead somehow 'come back to life' and side with him. When Thomas Plantard de Saint Clair establishes a New Age religion which is ecumenical in all regards, because that is a basis in the New Age of Aquarius, people will worship multiple 'Gods'. If Diana can be a Goddess, Tupac a God, Rachel Scott be held as a mascot of the supernatural Joel's Army, Lauren Townsend as a spirit hawk reincarnated as Horus, and Maitreya as a divine Master of Wisdom, what is that going to say to people? What is Thomas Plantard de Saint Clair going to promote? Why, the very basic teaching of the New Age of course. That HUMANITY IS GOD. A very Gnostic and Kabbalistic idea indeed. Besides Dawn Anna, who else connected with the Columbine shooting could be promoting the Joel's Army revolution in America? Heidi Johnson was a former student at Columbine and the friend of Rachel Scott. “Heidi Johnson, a friend of Rachel, was in the Columbine library, the main killing field, when the assault began. She said her faith in God gave her the strength to flee when the gunmen left the room for a while. “Johnson, who has transferred to a private religious school, said she shares her story with other teen-agers, but is uncertain much has changed in schools since that day. “'I honestly don't think I have seen a true, genuine change,' said Johnson, a junior. 'I think that kids tend to be really cliquey these days. Heidi Johnson, who knew Rachel Scott personally, is very much like a Bill Lind in that she promoted Christian-American conservatism and also, like the Linds, speaks very radically about America's need to get back to the Ten Commandments. “Heidi Johnson didn't volunteer to fight in America's culture wars, she got caught in the crossfire in the Columbine High School library. “A crowd of preachers, political activists, rock musicians and boisterous teens became extremely quiet last week when the willowy 16-year old spoke at a rally on Capitol Hill in Washington. She is one of several survivors who has spoken at religious rallies and conventions and faced waves of media interviews. Still, she seemed poignantly out of place in the marble-and-gilt environs of a U.S. Senate caucus room. “She spoke quickly, keeping her voice under tight control as she moved through the minefield of her memories. April 20 was a normal day. She went to the library at lunch, as usual. She heard explosions. The shots drew closer. Then the gunners were right there, killing the kids who were under the library tables. The story hasn't changed. It was real. Heidi Johnson was very active on the scene to promote a revolution back to a "Christian" America. She even starred in radio commercials for the Family Research Council, a politically conservative group similar to the Free Congress Foundation, which is advocating another American Revolution. “Just in time for kids to go back to school, the Family Research Council has unveiled a one-minute radio ad aimed at teens that stars a survivor from the Columbine School shooting. “'I watched in horror last April 20th as two boys burst into Columbine High School library and started killing my classmates,' Heidi Johnson says in the advertisement, which will run through September 3 in 166 markets throughout the country. Dominionists believe that God has commanded them to establish a theocracy which will force the Ten Commandments on secular society. Heidi who was once a friend of Rachel, seems to be one of the many Dominionist agents for whom the Columbine massacre is a rallying point for the mobilization of Joel's Army, the radical youth movement that will enforce the Ten Commandments in America. Today, Heidi Johnson, now married and known as Heidi Cortez, works at Trinity Christian Center. Following Columbine, however, she was very active in promoting the youth revolution by way of the media and even in the halls of government. “Heidi Cortez is a survivor of the Columbine High School Shooting of 1999. She was in the library when the shooting took place and witnessed several fellow classmates lose their lives. After the Columbine shooting, Heidi has traveled across the nation sharing her testimony of how God brought her out of the horrific events of Columbine. Her travels include: speaking with majority senate leader Trent Lott, providing solace in Germany after a school shooting, speaking in school assemblies across the world and sharing at the one year anniversary candle light vigil. “She has done interviews with Newsweek, Dateline, The Chicago Tribune and The Denver Post. She wrote a book, relaying her experiences with Columbine, entitled Silence Shattered. Heidi now keeps a low profile, but may at a future time become active as Joel's Army rises from the ashes of the Phoenix of Columbine, just as the New Atlantis will rise from the ashes of America. Meanwhile, Heidi and Torch Grab ministries are carrying Rachel's Torch and the Joel's Army youth revolution to other countries such as Germany. “During the shooting, I remained hidden under a library table as the gunmen paraded across the library, shooting and killing everyone in sight. My section was the deadliest section of the library where everyone surrounding my table was killed. At one point, the gunmen came over to my table and saw me crouched underneath. For reasons that remain unknown, they passed over me and left the library. As I saw them leave through the cracks of my table, a feeling of relief swept all over me--I was alive. Although the tragedy was over and I was able to get out safely, four years later, I still bare the scars from the war zone. If demons can put words into the minds of Darrell Scott and Craig Scott and convince them it is God speaking, if a Pastor named Bruce Porter has a prophetic dream about Columbine, if Dawn Anna thinks the hawk is her daughter flying around, and lots of strange premonitions precede the Columbine shooting, then it isn't hard to believe that the same demonic forces that caused all these supernatural phenomena also mind controlled the evil killers in their murderous act. The reason the supernatural forces had the two murderers pass over Heidi may have been to later use her, thinking that it was by God's grace that she was saved from certain death. While God can really do such miracles for benevolent purposes, in the light of all the demonic events surrounding Columbine, this may have been done by evil spirits to recruit Heidi Johnson to promote Joel's Army. Rachel Scott went to more than one church. One of them was Trinity Christian Center, which has the triskele (an occult symbol) as it's logo. Trinity Christian Church is openly Charismatic and is associated with Kenneth Copeland, Jerry Savelle, Jesse DuPlantis and Creflo Dollar who all teach the Dominionist Manifest Sons of God doctrine, i.e. that believers are divine and will soon be manifest as “gods.” This is also the church where Heidi Cortez now works. The other church Rachel Scott went to was Orchard Road Christian Center. Like Trinity Christian Church, it is a Charismatic church which promotes neo-pentacostal Wagner-type spiritual warfare prayer. Going back a little bit, why was it that all three girls knew they were going to die? Perhaps there was something fishy about Wendy Chapman's channeled message when she said the children who've died in school shootings agreed to die, before they were born on this earth, to teach humanity a lesson in New Age spirituality. The Dominionist Joel's Army and New Agers of Maitreya's brand, channelers and the like, are actually of the same mindset even though they have seemingly opposing goals. They both embrace Gnostic, pagan, and Kabbalistic ideas and really have much more in common with each other than not. More on this later. The story about Lauren Townsend being a hawk is not unlike the movie Dragonfly which is a story about a dead woman who is manifested to her husband as a dragonfly who leads him to South America to rescue his baby daughter that the mother dropped when she died. The entertainment media is filled with occult themes. Although they were portrayed by the media as a neo-Nazi white supremacists, Columbine shooters Dylan Klebold and Eric Harris were actually Jewish and were working, perhaps unknowingly, for the Judeo-Masonic conspiracy. According to the New York Times of April 26, 1999, Dylan Klebold's mother is Jewish and he was a practicing Jew. In fact, the Klebold family held a Passover Seder in their home shortly before the shootings occurred and Dylan actively participated. However, to avoid public awareness of his Jewish ethnicity, Dylan Klebold was buried with a Lutheran funeral, the religion of his father. It has been reported that the SWAT teams, police officers, and Federal agents at Columbine were “involved” in the massacre at Columbine. There was also a massive military presence at Columbine, which is something to be suspicious about. “The fact that police and SWAT teams remained outside 4 hours exchanging gunfire with (only 2?) assailants is proof there were in fact a lot more than 2 shooters; that SWAT teams had been informed that there were more than two shooters and had been ordered to stay back and hold off from any full-on intrusion for a period of time (almost 4 hours). It seems increasingly likely that FBI/BATF agents AND other trenchcoat-affiliated students involved with the mayhem inside the school needed sufficient time to 'clean up their act', remove traces of their presence and get out of there. “Four days after the massacre Linda's teen daughter (not a student at Columbine) went to see the memorial at Clement Park. What stuck out most to her was the vast presence of armed military personnel and their vehicles. THEY COMPLETELY SURROUNDED THE SCHOOL AND THERE WERE A NUMBER OF VERY LARGE COVERED TRUCKS PULLED UP NEXT TO THE SCHOOL. IT WAS THE MOST OUTSTANDING AND PUZZLING IMAGE (beyond the intense sadness) of the event. Who were the police shooting at? They could have been firing upon students in there, as 15 students dead is a long ways from 25. Also, why the military presence? Is this starting to look very suspicious? Rachel's funeral was held in Trinity Christian Center, the church Rachel used to go to when she was alive, and the report said that the daughter of "Linda" saw these military vehicles and soldiers around the school, which is less than a mile away from Trinity Christian Center, which can be seen from the school. Notice it said she saw the military at Columbine four days after the massacre...April 24, 1999. Rachel's funeral. It is quite possible that military were involved in Rachel's funeral to give an ominous message of what is to come, like the rise of the Stormtroopers in Star Wars. Even if they weren't there, the fact that military vehicles and soldiers were at Columbine on the day of the shooting should surprise true Christians everywhere. There is more information concerning the strange discrepancies following the Columbine shootings. “'It was not two hours before a SWAT team went in,' [Sheriff's spokesman Steve] Davis said,' in response to questions about the slow response times of SWAT members. 'Several other officers responded within three minutes, and the first SWAT team was in the building in about 20 minutes, Davis said. Efforts were slowed down by uncertainties about what was happening. A full-scale SWAT entry didn't occur until about 1 p.m., about a half hour after the shooting stopped.' It is generally accepted that SWAT teams simply did not enter the school until 12:30 p.m. or thereafter. If they did enter '20 minutes' after the shooting began no lives were saved and no one reported a SWAT team's presence at that time. “'We had initial people there right away, but we couldn't get in. We were way out-gunned', said Jefferson County Sheriff John Stone. "Out-gunned" by two kids who couldn't aim? There are indications that officers were receiving return fire from each entrance of the school during the first hour of the shooting. “'Shortly before 1 p.m., a second volley of shots rang out. Officers explained they were shooting to keep the gunmen down as deputies made their way into the building.' If the gunmen were dead by 12:05 p.m., who were the officers shooting at? “Numerous people from around the country have reported to Mr. John Quinn and the CRTF webmaster that they saw a large, blue "NATO" truck located on the Columbine High School grounds at about 11:30 a.m. It was shown from a helicopter. The cameraman zoomed in and immediately the video feed was cut. One source told CRTF, 'I remember seeing a large vehicle -- blue, black -- I remember it being dark in color, as for blue or black I am not positive regarding the color. However I do remember seeing 'NATO' on the truck and I remember the shield on the vehicle.' The words 'NATO' were possibly imprinted on a shield on the front of the vehicle. “Others reported seeing 'NATO' SWAT personnel. A news video tape was sent by a source to Mr. Quinn which showed these men with "NATO" inscriptions in white on their uniforms/body shields. Quinn says the uniforms/shields do in fact appear to say 'NATO', although the video is of poor quality. “As bizarre as the NATO reports are, we feel they are completely credible since dozens of people initially reported to John Quinn the same facts independently, and some facts that had not yet been released by Quinn were corroborated independently by various people. Whether the North Atlantic Treaty Organization was present seems very unlikely and remains unconfirmed. “Sgt. Mark Lewis of the Denver Police Department offered us this explanation, '...could it have been NTOA, which stands for National Tactical Officers Association?' The following web site offers an explanation per the NATO shields. A credible source also tells us that when viewing a Denver SWAT operation on TV in late 1999, completely unrelated to Columbine, he saw a large, blue truck with the letters 'NATO' imprinted on the side. The truck was part of the SWAT operation. “The Jefferson County Sheriff's Office says that 853 'pieces' of ballistic evidence was recovered during the investigation. If 853 actual shots were fired, such might indicate the presence of other gunmen. CRTF has also received reports that 1100 rounds of ammunition were fired, but this remains unconfirmed. Officials currently say Harris and Klebold fired about 200 rounds. “TIME Magazine reported on May 3rd, '...the killers fired off an estimated 900 rounds, using two sawed-off shotguns, a 9-mm semiautomatic carbine and a TEC-DC 9 semiautomatic handgun." The higher the number of rounds fired, the more likely other gunmen were involved. “CRTF has credible reports that .223 casings (or casings of similar size) were found in the school, along with different weapons, including an MT 64 50 assault rifle. Witnesses reported hearing the fire of fully automatic weapons throughout the day within the school. Some witnesses reported seeing 'machine guns' in the hands of the gunmen. Click here to listen to a Real Audio file of police and dispatchers mention 'large caliber' shots fired near the school. There were shell casings from a high caliber weapon found on the roof of the school where a 'sniper' or gunman was seen early on. Witnesses reported hearing automatic gunfire which could very well be the SWAT team and police shooting at students in the school. They've reported that police and SWAT were shooting after Eric and Dylan were dead, so who could have they been shooting at? The innocent students were most likely the victims of the extra 10 people who died; more could have died but it could have been covered up. it is important to consider that John Quinn, the author who reported the Columbine massacre may have been collaborating with corrupt police and SWAT, perhaps trying to incite radical militia groups or Christians (Joel's Army?) to rebel against the government. This is the agenda of the Dominionists who are identifying the U.S. Government/United Nations as the New World Order which is against Israel and are using Rachel Scott's death to promote a pseudo-Christian revolution amongst our teens for a theocracy in America. It has been suggested that the Columbine shooting was a planned event. Another reason for this speculation is because when lines are drawn between where school shootings took place, they form an X which is part of a large hexagram, which is an occult symbol, over the Western Hemisphere. See: School Shooting Map May Be a Hexagram Extending From Canada to the Tip of South America! In the video game Shattered Union, which is described in Barbara Aho's article “Death of the Phoenix” as leading young people to participate in the destruction of the United States, the map, which a player can play includes Colorado, specifically Denver and Colorado Springs, and Laramie, Wyoming amongst other cities. However, there is something suspicious in this “territory” that the makers of this game, PopTop Software and 2k Games could have put in as a “joke” or maybe not a joke. There is a strange “landmark” building located in the city of Denver (in the game) on the southeastern corner of the city hexes (this game is based off of hexagons when it comes to unit movement, which the Star of David is also based off of) which could be a landmark representing Columbine High School. Any landmark in the game Shattered Union is fully destructible, and this is promoted as a highlight of the game. However, this Columbine-like building had an altered look to it. The building is big and listed as a landmark and it is red unlike Columbine, however the shape of the building looks like an L-shape and Columbine High School can be a somewhat rough L-shape. Look at this space image of Columbine. There is no building in Denver which looks similar to the landmark depicted in Shattered Union. In order for the Antichrist government to be established in Israel (and ironically Dylan Klebold and Eric Harris were Jewish change agents to facilitate this agenda) the Judeo-Freemasons needed a justifiable reason to have people get used to more security measures. More security was the order of the day after Columbine, and the need for even more security was justified after 9/11. All of these crimes have been done to increase tension, and condition the young people, who will live through the horrible times of the reign of the Antichrist, used to having their rights being taken away. They believe it is best to start with the youth so the Gentiles (and some Jews too) will only know the oppression of the Kabbalistic Jewish empire and nothing else. After the Columbine shootings, there have been more Zero-Tolerance policies in schools. Many children have been traumatized and endured injustice at the hands of teachers and officials who constantly demonize them, imprison, and punish them. If one looks at the news, there is a never ending stream to demonize children as rotten murderous punks who have no respect, always cause trouble, and are always dying or getting into trouble. Young people get more jail time for similar crimes than older adults do, they are sent to war (which could happen during a second civil war in the United States, regardless of what side they are on), they often have unreasonable curfews imposed on them and teachers have even considered getting stun guns for school "discipline"! Many of the laws and media seem to be stacked against children. Maitreya the phony Christ may say that the world will become more just and not so oppressive after he establishes his reign, but the above statement by Marilyn Ferguson indicates it probably won't happen that way. Maitreya might 'do away' with teachers, media, and police abusing children... possibly... but still there will be bad things happening. If this happens, then the school zero-tolerance policies will intensify and this, in turn, will justify Maitreya's peaceful solution to the world. While opposing oppressive Zero-Tolerance and anti-youth measures in law and in media is not a bad thing, it may happen that if Maitreya supports this agenda and it is loved by children everywhere, then they'll be more likely to support Maitreya's other ideas as well. Under the government of the Sanhedrin (either the true or fake one), it will be just as bad or worse for all Gentiles and Jews who oppose them--just like children in our schools face. In the wake of the school shootings, Darrell Scott and Beth Nimmo promoted two programs, Rachel's Challenge and Life Choices respectively, as a way to stop school violence and promote compassion. But in exchange for protection they promote brainwashing youth in the Joel’s Army doctrine which trains children to become the new fascists in the New Theocracy which will one day be persecuted by the Sanhedrin when the Noahide Laws go into effect -- after the massive death and destruction they will cause in America. Joel's Army may kill many true Christians in the name of God, but the Sanhedrin (either one) will not treat the true Christians any better than Joel's Army would. It is quite ironic that Rachel Scott said she wanted to start a chain reaction of kindness, and Eric Harris (one of the shooters at Columbine) wanted to start a chain reaction of violence (Columbine victim's father wants 'Chain Reaction'). What is really ironic though is that Rachel Scott's death, which served as the catalyst for the rise of Joel's Army, will directly cause and create the very same thing the Scotts and other Columbine victims claim to want to stop...violence. In the movie, Star Wars, before the rise of the Empire, the Galaxy wanted the Trade Federation to be stopped by the new clone/Stormtroopers but eventually it was those same Stormtroopers and their leader Emperor Palpatine whom became the very bad people they've sworn to protect everyone from. So it shall be with Joel's Army. Even now many Christians and non-Christians alike have proclaimed President George Bush to be just like this, using the War on Terror as an excuse to take away America's freedoms and become a tyrannical country which will eventually be destroyed by the Judeo-Freemasons. Rachel Scott may have preached kindness to counteract Eric Harris' and Dylan Klebold's chain reaction of violence, but by doing so, Rachel Scott and her family have caused the very thing they claimed to be against. Because of their actions, not only will many fall at the hands of Joel's Army, but the Sanhedrin could eventually one day have justification to kill every last person who believes in Jesus Christ the Lord as well. The Scotts, and many others, have been a catalyst for the rise of Joel's Army and have started a chain reaction of violence. Which raises the question, who is masterminding the creation of of these war games which are programming children to become criminals and revolutionaries? Would they happen to have the same agenda as the Judeo-Freemasons and their Grand Master, Thomas Plantard de Saint Clair, which is to polarize the masses, to bring about revolution and civil war in order to establish a New World Order out of the chaos they have created? Perhaps a close look at a popular American video game series which is similar to “Doom” will give us clues as to the source and agenda of these war games. “Halo 2” is the sequel to “Halo” which was produced by Bungie Studios and came out on Xbox. Bungie was bought by Microsoft which plans to make Halo a trilogy. The symbolism of three is seen in many popular serial movies today, such as Tolkein's heavily Gnostic, pseudo-Christian Lord of the Rings, Star Wars and the Matrix trilogy, produced by the New Age/Jewish Wachowski brothers. As of January 2005, Halo 2 had sold over 6 million copies and together with Halo sold 12.8 million units around the world. (MSNBC) On its opening day of sales, Halo 2 made $125 million, making it the highest grossing profit on the first day when compared to movies and other video games. According to Microsoft, “Halo 2 still dominates the top 10 Xbox Live games in terms of total time spent online.” Not only that, but Peter Jackson, the producer of the Lord of the Rings and King Kong officially announced to make a Halo movie. It seems like the people at Bungie and Microsoft really want Halo to influence lots of viewers worldwide with their games and movies, as it is rumored the Halo movie will be out in 2007. The six-pointed star is the occult symbol of divinity and we know from II Thessalonians 2:3-4 that “the man of sin, the son of perdition...exalteth himself above all that is called God, or that is worshipped; so that he as God sitteth in the temple of God, shewing himself that he is God.” Judeo-Freemasons believe that Adam was androgynous before he fell at which time he separated into male and female and that his original state of androgyny was divine perfection. According to Judeo-Masonic authors of The Second Messiah, the False Christ will be called the Third Adam or Thrice Perfect Father Adam. Revelation 13:7 foretells of the Antichrist, “And it was given unto him to make war with the saints, and to overcome them: and power was given him over all kindreds, and tongues, and nations.” If the Master Chief in the video war game, Halo 2, represents the Antichrist, who do his enemies represent in real life? The Halo 2 game portrays the United Nations as a ruling military body as well as a global (or in this case a galaxy-wide) military force for humanity. Many end-times ministries are predicting that the United Nations is the fourth beast that will take over the world and Bungie/Microsoft seems to be trying add to the chaos that will happen if there is a war in real life between Christian militias and the UN as headed by Maitreya. “The Covenant is a militarized theocracy consisting of a galactic alliance of several non-human races in the Halo series. Members of the UNSC will sometimes causually [sic] refer to members of the Covenant as “Covies”. For those of you who don't know this game, Bungie seems to be trying to promote war between Christians and non-Christians. The UNSC (the human forces) represents secular society and the United Nations, and the Covenant represent the “militarized theocracy,” a term that will describe the Inquisition of Pope Benedict XVI and the theocracy established by the Dominionist Joel's Army. These parallels are very easy to see and even blatant to anyone who has ever played these games. Notice how even in the Halopedia, the games Halo and Halo 2 depict the Covenant to be like Christians and Muslims. The three High Prophets could be a representation of Pope Benedict, as these prophets command the aliens' forces of the religious Covenant in the same way Benedict would be allied to Joel's Army. The Covenant despise humanity because they think of them as “unholy” -- unholy being a Biblical word and, unfortunately, many people today think of Christians as very prejudiced and evil, even violent people and this game furthers this misconception. In the second quote which referred to the civil war between the Elites and the Brutes, this would represent the Second Civil War in America or the Civil War in the Church which is promoted by Rick Joyner. Also mentioned are the “Forerunners”, which could be a Masonic reference to ancient aliens, known as the Annunaki (Nephilim or fallen angels) which came to earth to populate it with their DNA. (Gen. 6) Notice how they said the Prophets (cf. Benedict XVI) were looking for the Halos. When activated, the Covenant believed that they'd all be transformed into Gods in an event called “The Great Journey.” The real truth though, as the game player finds out, is that when the Halos are activated it destroys all life in the universe and that is why the Forerunners died. Now the Covent wants to activate the Halos in order to become Gods! This represents two things, which is a mixture of New Age, Gnostic, and Christian allegory. The Great Journey may be the “Rapture” in the view of the Judeo-Freemasons at Bungie and Microsoft. There are basically two views of the Rapture -- the Biblical view and the Gnostic view. Biblical view: The event before the start of the 7 year Tribulation when Jesus takes His true believers, body and all, into heaven so they won't have to endure the pain and persecution the world will suffer when the Anti-Christ rises to power and God delivers his judgment on earth. Gnostic view: This is believed by people in Dominionist Manifest Sons of God churches where, instead of Jesus taking up the believers before the Tribulation starts, they will become glorified as "Gods" and become immortal and, as Joel's Army, impose their Christian Dominion on Earth, and only then will Jesus come once the world is under the control of Joel's Army. Halo 2 portrays both factions. Master Chief knows that if the Prophets find one of the many Halos, they could destroy all life in the universe. The original Halo was about the Master Chief trying to prevent the Covenant from activating Halo. The Covenant's version of the "Rapture" means both the sudden death of all life in the Universe (which Bungie portrays as the Rapture when all believers are taken away by Jesus) and the Charismatic Manifest Sons of God kind (they'll all become Gods)! If one looks at the Halopedia website, many of the characters and other entities have strange names which denote that they have counterparts in real life. For example, there is a building called “The Ark” which is named probably after the “Ark of Covenant” from the Bible. Considering the alien force is called the “Covenant” and the “Ark” of Halo is the place where all the Halos are activated, Bungie and Microsoft seem to have their hands full of Masonic symbolism right there. So the Atlantean Ark was “sequestered away” in Great Pyramid of Egypt like the Ark in Halo was “sequestered away by the Forerunners, probably somewhere on Earth in remote pre-history.” High level Masons claim that the pyramids at Giza are situated in the same formation as the three stars in Orion's belt and, according to Halo 2, this Ark is alleged to have been transported to the constellation of Orion where it resides on the middle star in Orion's Belt. Interestingly, in Egyptian mythology, Isis and Osiris escaped the Flood on the Ark which carried them to the Milky Way. According to Crystalinks, the Atlantean Ark is an EM machine, and if someone connects with it, their soul experiences two realities at the same time. That fits in with the Ark being the remote to activate the Halos and cause all life in the universe to die/become Gods. This corresponds with the concept that the Atlantean Ark turns “spirit into matter and matter into spirit.” In other words when “all life in the universe is killed” by the Halo Ark, that is another way to saying it has the power to make someone become spirit and matter interchangeably. Also, notice that uninitiated people *cannot* go to the Atlantean Ark. Maybe here, the two people in the Halo game (which will be Halo 3 because the story isn't done yet) who can go in the Ark are going to be the Master Chief and High Prophet. Since the Master Chief is the Anti-Christ (i.e. Thomas Plantard de Saint Clair) he would be the most qualified to be able to touch the Ark. Thomas would probably have to do with the fake Ark of Covenant (the Atlantean one which levitates to the Pyramids) while Master Chief can get to the Ark in the coming Halo 3 game. There is also a Flood which seems to be named after the Flood in the Bible which destroyed Atlantis. The Flood in the Halo 2 game are infectious creatures which turn humans and Covenant into zombies, and in Halo and Halo 2 the reason why the Halos were made as super weapons, according to 343 Guilty Spark (he is an AI construct the Forerunners built), was to prevent the Flood from spreading by taking away their food source... all life in the universe! Here, it says the Brutes are replacing the Elites as the servants of the Prophets. As a result, the Elites are being hunted down by the Covenant forces loyal to the Prophets and the Elites, along with Grunts and Hunters, join the human forces and the Master Chief to fight against the Prophets. This seems symbolic of the Civil War in the Church scenario led by Joel's Army. Here is a sample of the agitation propaganda of certain Charismatic Revivalists who are predicting (and trying to foment) a literal physical battle between Charismatics, who rely on extra-biblical revelations like signs and wonders, against Christians who rely on the Bible alone [Sola Scriptura]. But you know, I think there's going to be a debt to pay, and I want to say this with sobriety. We were talking about this the other night, and I remember when we were there in 1989 at Metro Vineyard in Kansas City, and I remember when Bob Jones shared this vision. And we were talking about this, but I think that this is, in a sense, a propos for tonight. In 1984 we didn't just have a vision about the cup bearer and the baker. He had another one, and that was about the church. And the church was gathered in a large civil war-type big stately mansion, a big ballroom, and they were dancing. And they were dressed in colorful clothes and happy, and they were moving and they were laughing and they were dancing and they were just having the wonderful party of their life. And he looked at that and Bob began to laugh and he said "Look at them dance, look at them have fun." And an angel came and said "Wait. Not yet." And then what happened is that strangely in the ballroom, the crowd began to change, and they began to take sides, and they began to have blue coats and gray coats, and in a moment civil war broke out. A bloody civil war broke out. James Ryle has had a similar vision. The Lord even showed him how the blue coats stand for the revelatory, the revelation, and the grey for grey matter, man's wisdom. And in this context the north fought the south and the south fought the north, and the south wanted to keep the people enslaved. They wanted their money. They wanted their bodies. They wanted their personhood to keep the system going. And the north said No! Freedom! Freedom! And they went into a terrible fight, and it was father against son, brother against brother, and a man's enemies were in his own house. And the angel said this: "There won't be a house that escapes weeping." We do not know how long this time of visitation will continue in this capacity. But when the time is up you run with all your might, because as this begins to be known throughout the entire Christian community of the world, there will come a polarization. There always has come a polarization. And there eventually will become wars. There will be wars in your household. Your own family may not understand what's going on. Your own family may turn against you. That doesn't mean they're evil. That just means as Christians they haven't seen this aspect of the Holy Spirit. 'Cause they're Christians. We're talking about Christians. But the end of the vision was this: that after the time of bloodshed, the Lord was going to heal the breach. And then the harvest will come in." Bungie's game could be symbolically referencing the possible betrayal of the Joel's Army, as symbolized by the Elites. Joel's Army may represent the Elites, but it seems like it portrays the Prophets (Benedict XVI) as betraying the Elites (Joel's Army) while the Elites are replaced by the Brutes who are hunting them down and killing them (Zionist Sanhedrin or Zionist Jews?). Could the Prophets also double up on representing Pope Benedict AND the fake Sanhedrin? Then Thomas Plantard (SPARTAN-117) who leads the UNSC (or could double symbolize Maitreya as well?) JOINS FORCES with the Elites (Joel's Army) to fight against the Pope/fake Sanhedrin and prevent the Ark from being activated? Also, when Halo is made into a movie, it will probably end up further polarizing secular/New Age society against Christian Fundamentalists/ Dominionists, as well as generate animosity toward the Catholic Church and the Pope, much like the recent Star Wars film, Revenge of the Sith, tries to depict the Emperor as the Pope Benedict. These are a rough projections, as all of these projected scenarios and parallels are, but the point is that Halo 2 depicts the betrayal of Joel's Army (Elites) by possibly their Pope/Fake Sanhedrin (Prophets) and the Arbiter (Master Jesus?) takes his fellow Elites and joins forces with the Master Chief (Thomas Plantard de Saint Clair) and the UNSC forces (Maitreya/UN) to fight against the Pope (Prophets). When the Master Chief possibly goes to the Ark in Halo 3, it could symbolize some sort of supernatural event like the phony Ark of Covenant from Atlantis symbolizes. The Arbiter, however, was worshipped by much of the Covenant society as a Messiah. As it says, every Arbiter was martyred or killed in the process of performing his duties. If the Arbiter dies, and was seen as a messiah, he could be seen as a Jesus Christ-like figure who died and sacrificed himself to the cause of a New Age for uniting the Elites (Joel's Army) and UNSC (UN/Maitreya) while Master Chief (Thomas Plantard) lives and stops the Ark from activating, thereby preventing the destruction of all the universe. While the Arbiter in Halo 3 might possibly die as a sacrifice, the Arbiter's death could also symbolize the transition between the Church Age of Jesus Christ to the New Age of the Antichrist. DOMINIONIST REVIVAL OR SHATTERED UNION? In the video game Shattered Union, which gives young people the opportunity to participate in the destruction of the United States, there is a nation-state in what was once the United States which is called Pacific Northwest, but was once called Arcadia. The creators of Shattered Union renamed the Arcadia faction to “Pacifica,” however, one of the ‘territories’ that Shattered Union gives ‘Pacifica’ is called “Southeastern Arcadia.” The Shattered Union faction “Pacifica” also has a special power called “All Seeing Eye” which is another hint that its maker, 2k games, is part of the Judeo-Freemasonic cabal as stated in the “Death of the Phoenix” article. Shattered Union also states that the nuclear attack in Washington DC in the game was caused by a foreign power, the Russians. Because they probably have "insider knowledge," 2k Games and PopTop may be sending a message that, should something of that nature were to happen in real life, it would be caused by a foreign power. In reality, however, the Judeo-Freemasons would have caused the nuclear attack, if real life followed the Shattered Union timeline. This is one of the features of Civilization IV. If you “research technologies” which includes these 7 religions, including Christianity, Judaism, and Islam, you get “gain gold and create Great Prophets.” Is “gain gold” sending a message that the church is now synonymous with business i.e. the Rick Warren’s Purpose Driven model? And does “create Great Prophets” mean that Great Prophets or great “profits” can be made? False Prophets anyone? It seems like anything can be made, including a false savior. That is exactly what is happening today. Besides Shattered Union, other videogames also depict the destruction of the United States as a goal. One such game is called “Destroy All Humans.” In this game by THQ, the player plays as a mean looking alien named Crypto who tries to destroy all humanity. What is quite ironic is that it is set in 1950s America, with locations which represent a rural town in Iowa, a New Jersey type Port town, Los Angeles, a farm town near St. Louis, and Washington DC. The player named Crypto goes around in a fictitious 1950s America where he zaps humans, vaporizes them, steals their brains, and destroys entire buildings and towns with his flying saucer. Meanwhile, they seem to be making fun of the anti-Communist fervor of that period in America's history, the 50s, when they call Crypto a “little Commie.” This was probably meant to be a satire of American family values. Also, this videogame includes as one of Crypto's (meaning the player) objectives to assassinate the President and, not only that, but to kill all members of Congress as well. In one scene, after Crypto (the player) kills the President, there is a cut scene where "Men in Black" which look like agents get a hold of your spaceship and, as they are trying to destroy it, accidentally cause a nuclear explosion in Washington DC (or in this game, it's fictitious look-alike) in which the player needs to start the game over again. This game was quite popular in the United States, but why would a game try to glorify aliens who kill the U.S. President, blow up entire cities, and vaporize masses of people? Well, according to Maitreya's website, Share International, incorporeal aliens called “Space Brothers” seem to be instrumental to the bringing about the New Age. At the end, Crypto encounters the “End Boss” who looks like a Darth Vader-equse character and she takes off her mask. Crypto asks her, “You're a chick?” She says to Crypto “I'm a Patriot.” Then the player (Crypto) proceeds to fight her around a partially destroyed Pentagon-like building called the Octagon. That reminds people of the 9/11 attacks when the Pentagon was struck as well as the World Trade Center. This “Patriot” woman is the head of the MiB, government agents who are there specifically to counter the alien threat. What is ironic is that the videogame makers try to portray her and her organization called “Majestic” as analogous (probably patterned off of Majestic 12) to George Bush and his War on Terror which has been the catalyst for destroying America's “Bill of Rights.” This is stated earlier in the game when she tells a military general that she operates the “5th branch” of the military, and all 4 branches need to be under Majestic's command to fight the new alien threat. This happens earlier at the Octagon. When Crypto finally defeats her, she says to Crypto in her dying moments something like “America isn't the only country in this world” in response to Crypto saying he wants to destroy all humanity. What is meant by “America isn't the only country in this world” is that she (or the game makers) were saying that America shouldn't arrogantly think it is the only country in this world. But now since Crypto will destroy all humanity, it seems like America will be destroyed first as if by punishment for it's arrogance. All the while teens who play this game are having all the fun in the universe destroying America. Doesn't this sound a bit like what happened in the video game Shattered Union, anyone? Especially the part where Washington DC is destroyed by a nuclear explosion? The Anti-Semitic Anti-Zionist Maitreya the Christ and his New Age allies. The 'Radical liberal Christians' who are openly pro-Gay and liberal could be on Maitreya's side, as stated in The New Reformation. Joel's Army and the Charismatic Dominionists who are very pro-Zionist and pro-Israel. They'll oppose Maitreya for trying to spread anti-Semitism and promote very un-American and un-Christian values. The Fundamentalist Christian militias which support Israel but at the same time are against Joel's Army. These may be comprised of 'End-times' Christians and Jews who read about the dangers of Joel's Army being anti-Semitic and the UN/Maitreya but will be confused once they find out Joel's Army is pro-Semitic and will NOT betray the Jews but instead BE betrayed by the fake Sanhedrin. The Neo-Nazi militias who will kill Jews, but most likely won't be on the side of Maitreya because they are illegal in and of themselves. Maitreya doesn't like armed militias roving around killing people, even if Maitreya claims to be anti-Semitic himself. However, what might happen to bring to power the TRUE Anti-Christ is a devious plan that involves very strange political maneuvers to end the chaos of the war. Thomas Plantard, being the TRUE Anti-Christ, will come to power on a platform of peace to stop the chaos of war. As Daniel prophesied: “...and he shall magnify himself in his heart, and by peace shall destroy many...” (Dan. 8:25) As per the “Death of the Phoenix” article, Joel's Army will be betrayed by the FAKE Sanhedrin and sentenced to death under the Noahide laws. To illustrate this point, a rough timeline has been devised. Maitreya the false Christ comes during the Day of Declaration following a major disaster. Pro-Israel Christian militias brace for the persecution from the 'UN/NWO/Maitreya conspiracy' as well as the wrath of Joel's Army and the Neo-Nazi militias who will try to murder the Jewish allies of these Dominionists. The international community, the UN, and the U.S. Government use the radicalism and violence caused by Zionist agents provocateurs within Fundamentalist Christian militias as justification to actually persecute them, thereby fulfilling Bible prophecy. Joel's Army is mobilized in response to Maitreya's New Age to try to counter their New Age anti-Semitism, but also face the threat of the Christian Fundamentalists who know they actually embrace New Age concepts themselves. Joel's Army have sworn to protect the Jews from the Neo-Nazi militias and and help evacuate them to Israel. Neo-Nazi militias are called up by Judeo-Masonic agents provocateurs to fight the Zionists whom they believe are the sole cause of all of the world's problems, but don't know that the Jews led them to violence to justify Joel's Army defending them and to give many Christians, both in Joel's Army and Christian Fundamentalism, a reason to think Bible prophecy says the Jews will be persecuted by the Anti-Christ forces as promoted in the Left Behind books among many others. During the fighting among these four factions, once Joel's Army has secured many of the Jews safe passage from America to Israel, thus giving the impression of more fulfilled Bible prophecy, the FAKE Sanhedrin will persecute Joel's Army for being so violent and killing lots of people in America, thereby betraying one of their allies that helped protect them from attempts of Maitreya and the Neo-Nazis to have the Jews destroyed. The Christian Fundamentalists will think it is good that Joel's Army is being destroyed for their New Age ideals and will think it was God's way of getting rid of a potential traitor to the Jewish people. Meanwhile, Maitreya is in utter shock (not really) that the Fake Sanhedrin are persecuting their own ally, Joel's Army, and the Neo-Nazi militias give that as a reason the Jews are very bad. The Antichrist, Thomas Plantard de Saint Clair, comes on the scene to 'save the day' and shows the whole world the evil nature of the Zionist Jews because they betrayed Joel's Army, and are fighting against the ecumenical views of Maitreya, and prove that "Neo-Nazis" where right when they said the Jews were bad. However, Thomas Plantard, being Jewish himself, will not condemn all Jews to death. The Fake Sanhedrin and the Zionists will be put to death by Thomas Plantard, whom Maitreya the counterfeit false Christ and his New Agers, and the betrayed Joel's Army looked upon as a savior. The Neo-Nazis could end up being executed too or given amnesty for helping fighting the "Zionist Conspiracy" which Thomas Plantard helped to stop. Thomas Plantard is deemed a hero and is the True Anti-Christ to be loved because he brought peace to the world and helped saved Maitreya's New Age ecumenicalism, Joel's Army's Gnostic Christianity, and provided a reason for the Neo-Nazis to stop fighting and Anti-Semitism to stop because Thomas stopped the Zionist conspiracy. In other words, Thomas will have saved humanity from destruction (so far). Meanwhile, the TRUE Sanhedrin, which is comprised of the Elders of Sion of the 33º, will be established in Israel by the Antichrist as a compromise who will also establish an Empire of the New Age of Aquarius where Maitreya the Christ and Joel's Army live side by side. Joel's Army will think Master Jesus to be the real Jesus of Nazareth (Master Jesus is Maitreya's 'disciple'). However, Thomas Plantard is still a Kabbalistic Jew who will enforce the Noahide Laws after he establishes peace, the same laws used by the Fake Sanhedrin to persecute Joel's Army. The true Sanhedrin will enforce the Noahide Laws against the remaining Christians who hold true to Christ and have been left behind from the Rapture. With Thomas Plantard at the head of the TRUE Sanhedrin/Elders of Sion, there is little to no opposition to his will by either Maitreya or Joel's Army, and with a combined-arms force Thomas will order all the TRUE Christians who remain dear to the TRUE Jesus to be executed by Maitreya and Joel's Army. How will Thomas Plantard be able to unite the remaining Joel's Army and Maitreya together to fight against the "Zionist" Jews? What proof do you have of this? Well, it is true that many Rabbis and Jews are actually not Zionist, but are against it. While these Rabbis and Jews who don't support the Zionist state of Israel are not Anti-Semitic nor do they hate their own race or religion, they say they are true to the Torah while the Zionist Jews are not. This is very true, however these anti-Zionist Jews, of whom Benjamin Creme may be one, could be deceived by the true Anti-Christ Thomas Plantard de Saint-Clair when he comes to establish his true Sanhedrin and obliterate the fake Sanhedrin after they've persecuted Joel's Army (of course Benjamin Creme isn't deceived since he probably knows the plan). The anonymous author of this expose was drawn into the occult as a teenager who was deeply affected by the Columbine massacre. To learn more about the Columbine tragedy, he read books and articles by the parents and friends of the victims, as well as internet sources; he watched movies about Columbine such as “Dawn Anna,” and even made a trip to Columbine High School. While visiting Columbine, he noticed three hawks flying over the school and this experience commenced a lengthy period of being followed everywhere by hawks and owls in the sky. When he inquired about the hawks and owls, he was contacted by a teenager who had been a close friend of Lauren Townsend. The friend explained that the hawks were Lauren Townsend, Rachel Scott and Cassie Bernall and that they fly over over Columbine High School to protect the students. He was also told that the hawks and owls were Lauren Townsend trying to tell him to talk to this friend, who communicated frequently with Lauren in her dreams. The modus operandi of the Columbine parents and their network of operatives has been to use the Christian and mass media to convey the idea to young people that the Columbine victims were Christian martyrs who have been reincarnated. When impressionable teenagers begin to see these demonic manifestations, they are advised by the Columbine operatives to consult with those who regularly communicate with Lauren, Rachel, Cassie and/or other Columbine victims. Our author described this as a “stealth operation” for recruiting teenagers for the youth revolution that will one day be mobilized as Joel's Army. The Columbine operatives know that the teenage recruits will eventually begin communicating with the evil spirits themselves, who will give them more detailed instructions, and that these young people will be instrumental when it comes to mobilizing Joel's Army during the Tribulation period. These early recruits will most likely be the “Elite” Joel’s Army troops who serve a more important and specialized role than the rank and file Joel’s Army forces. It is possible that, to boost enlistments in Joel's Army when it rises to power, the evil spirits manifesting as Lauren, Rachel, and Cassie will stage the resurrection of the dead Columbine victims. When the Columbine goddesses are “resurrected” in the public spotlight, those were recruited as ‘special operatives’ will help recruit the masses of children and teenagers into Joel’s Army. Could this be what Paul Cain had in mind when he described the mighty miracles that will be performed by Joel's Army? One identifying factor of Dominionists is statements such as the above which subtly implant in the reader’s mind Dominionist/Reconstructionist ideals of “reclaiming America for God” or, more obviously, having “another American Revolution.” Such expressions may seem harmless, and even patriotic, however, there will come a breakpoint, as the carefully laid Jude-Masonic plans for destruction of the United States come to pass, when the Dominionists actually attempt to take control of the U.S. government and establish their Theocracy. This will, of course, provoke a violent reaction from the radical Left and, at that point, the agents provocateurs on both sides will call up their troops to stage a revolution to “save America” from the other side. The outcome, however, will be the overthrow of the U.S. government, which was the Judeo-Masonic plan all along. For this reason, “revolution” is never God’s solution to the evil conditions that exist in a society. In fact, revolution is one of Satan’s chief means of entrapment -- “for rebellion is as the sin of witchcraft” according to I Samuel 18:23. For the sin of witchcraft has serious consequences, such as demonic oppression and even demon possession. So it is not surprising that young people who are lured into the Joel’s Army revolution are introduced to supernatural manifestations of evil spirits with whom they are encouraged to communicate, an activity which brings with it a curse. For this reason, true ministers of God have an obligation to teach their congregations -- and parents have a responsibility to teach their children -- the commands of God as they are found in His Word and to warn them of Satan’s devices to lure them into his kingdom of darkness.